I hadn't paid much attention to the setup on this day. Friday and Saturday had been overcast with periods of light rain about, and although the cloud was expected to clear early Sunday I wasn't really anticipating much in the way of storms. 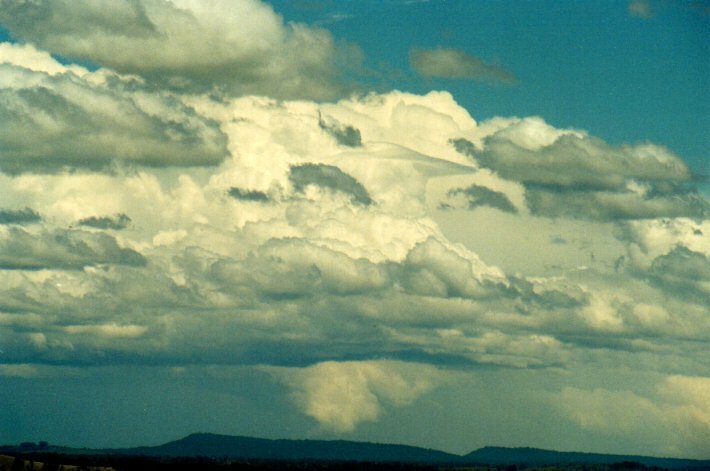 The only positive sign I had in the back of my mind was the storms that had occurred yet again in the North West Slopes and Plains districts. Sunday morning had the cloud band largely clearing. Winds seemed to be west of north, not usually a good sign, but the instability was obvious in the mid-level clouds that persisted. Humidity was high from the 20mm of rain. 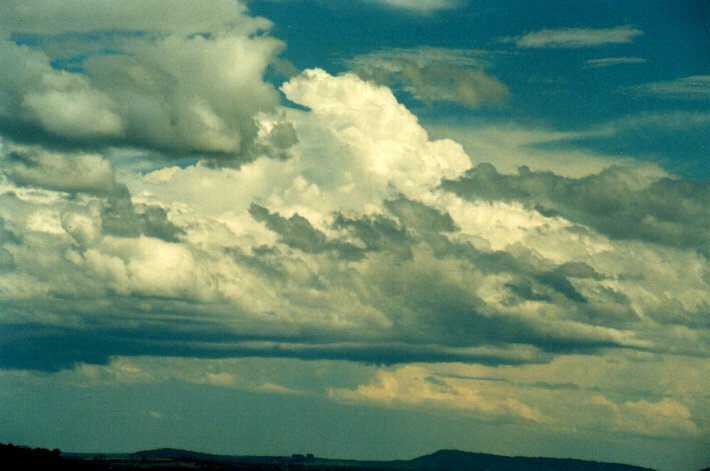 Around 11am, cumulus formed and tracked towards the southeast. Closer to the coast (I'm 20km inland) they exploded into congestus with pilleus, but these initial cells soon collapsed. At about the time I started to take the situation more seriously and checked out the AVN model to forecast the afternoon potential (yes, rather slack checking the setup so late in the day). I cannot recall the forecast values, but the AVN model analysis for 06z shows LI of -2 to -4 and CAPE over 1000 for the Northern Rivers. Surface and 850 relative humidity was high with some drier air to the west at 500hPa. A NW jet of around 90 knots was in place with NW winds established down to about 850hPa where they veered to the north. At the surface S-SE winds were intruding into the far North Coast. The temperature at 500hPa was about -11, so all in all a very good set of figures for thunderstorms including severe weather and the possibility of supercells. 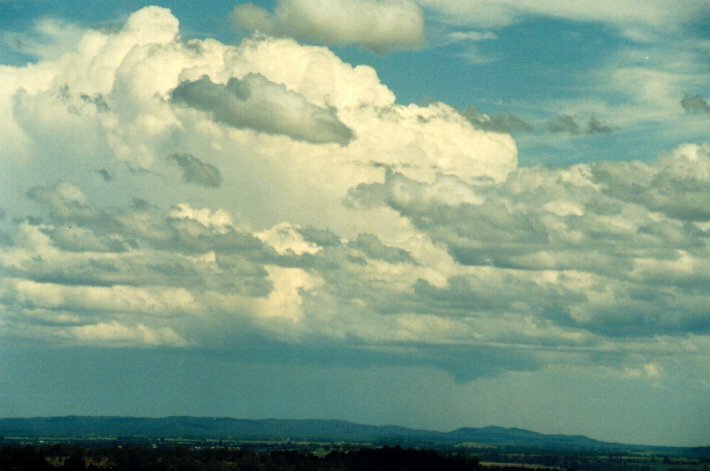 The great thing about NW steering flow setups is that storms forming in SE Queensland or the Border Ranges end up in the Northern Rivers, and are usually easily to view and intercept. 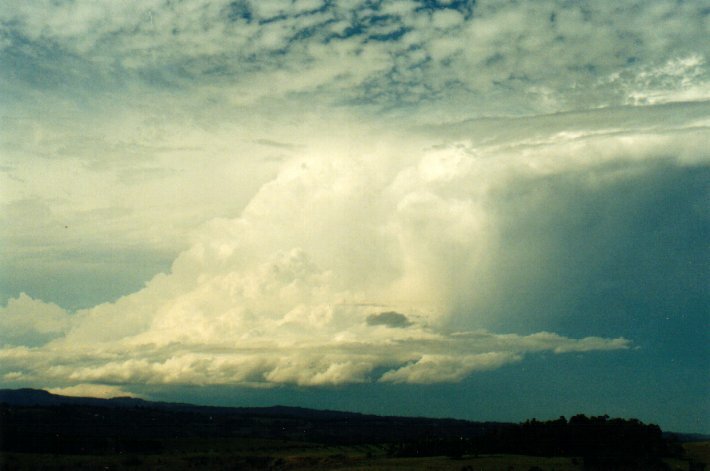 However, it does make it hard for chasing cells that form on the Richmond Range well to the southwest. I made contact with Dave Ellem and he was keen to chase. 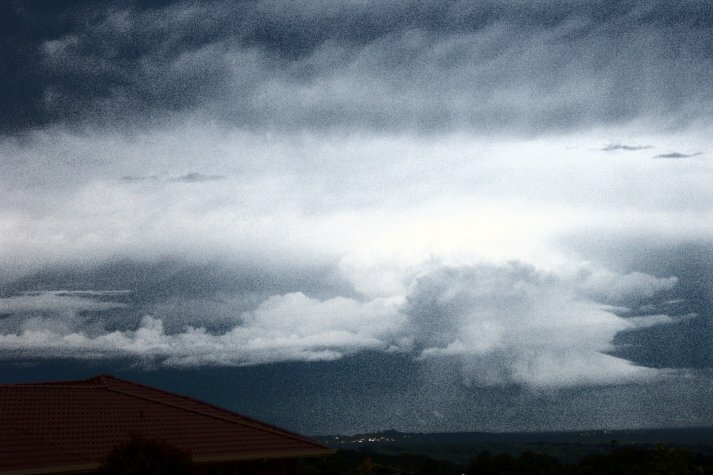 We headed west from about 12.45pm (and got a call from Jimmy right away about golf ball sized hail in the Hunter!). 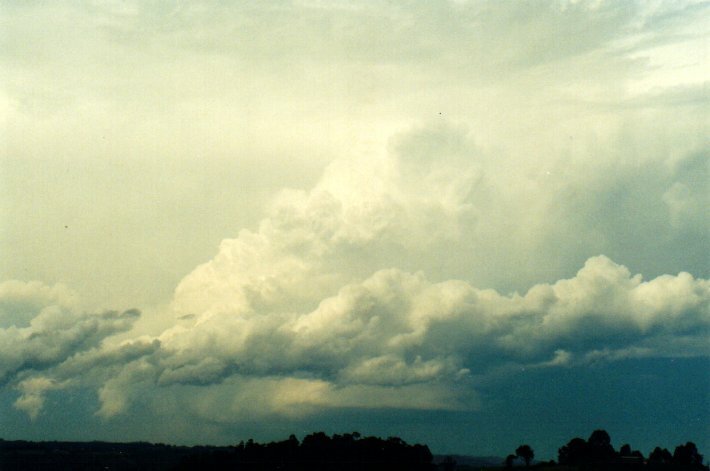 By this time weak activity was occurring locally, and much more substantial storms were active in a NW to SE line to the south and southwest, the closest about 50km from the Lismore Casino area. 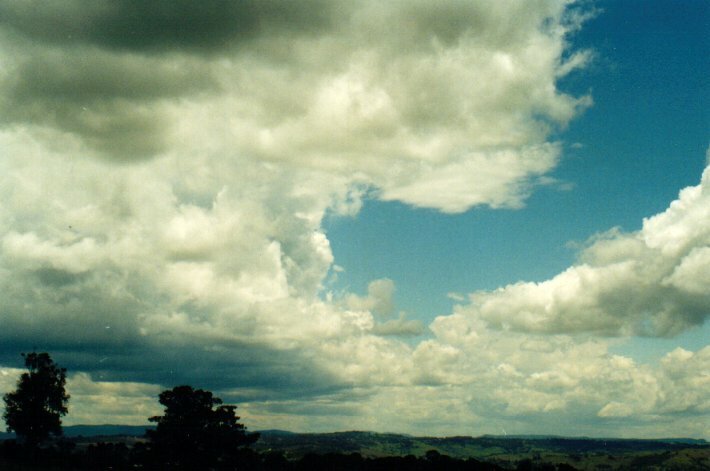 The Bureau had already issued an STA for the Hunter and Mid North Coast and later added the Northern Rivers. We stopped at the Parrots Nest lookouts south of Lismore and enjoyed the show as numerous cells formed, almost all dropping suspect lowerings including a few funnel shaped ones. 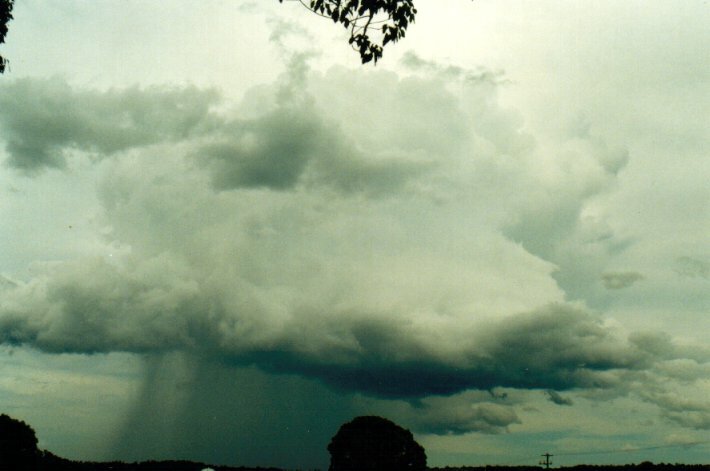 Due to the distance from us to the cells, there is no evidence of rotation recorded. None of the cells we observed in that direction were particularly high topped, probably 10km max. After about an hour with no development occurring to our NW, we decided to make a move. There was weak activity to the north but nothing to entice us that direction yet. 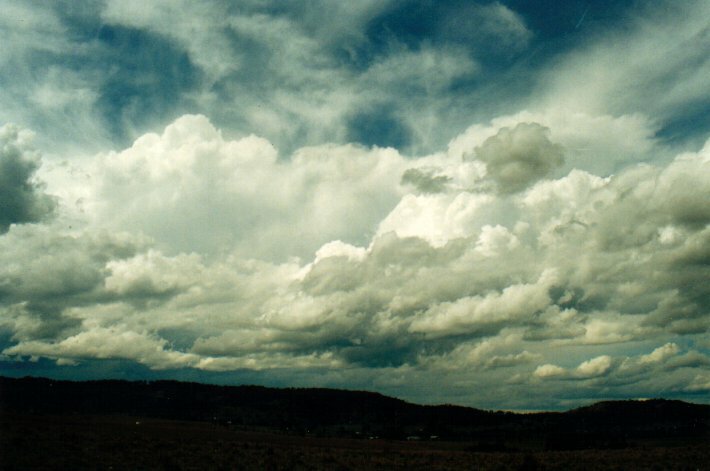 A drive to Casino for a drink maintained a pessimistic outlook for activity forming to the NW - it was rather clear with only smallish cumulus. 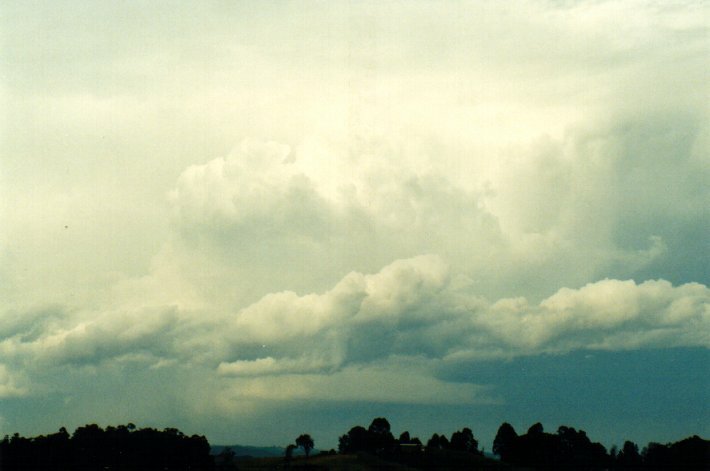 Storms were still in the same line to the south and activity was to the north and in Queensland. 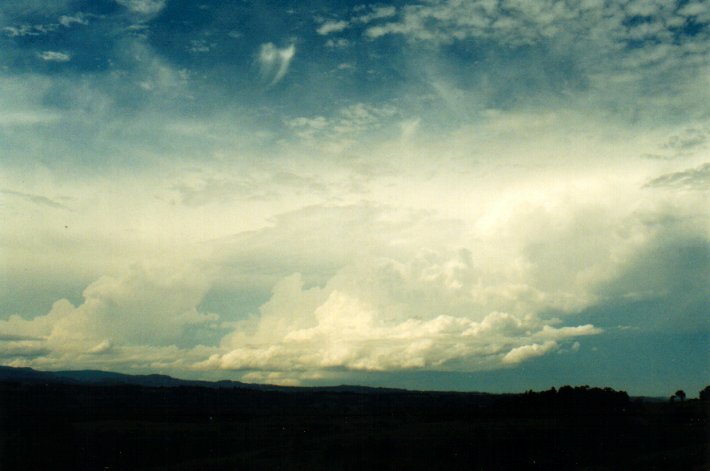 Heading back east a small cell began to develop NW of Lismore. 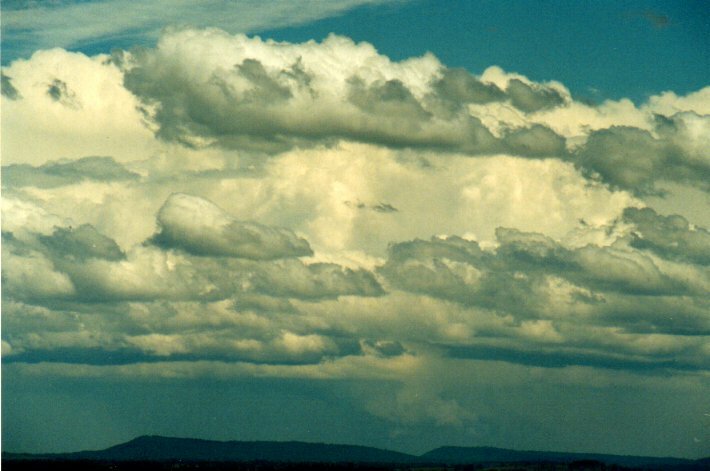 It took on nice rain free base features but the top was poorly contrasted against the cirrostratus from background anvils. 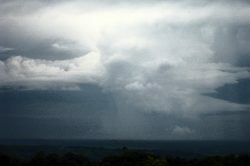 We arrived back in Lismore at 2.50pm as the cell was just NE of the city. It had just begun to precipitate. 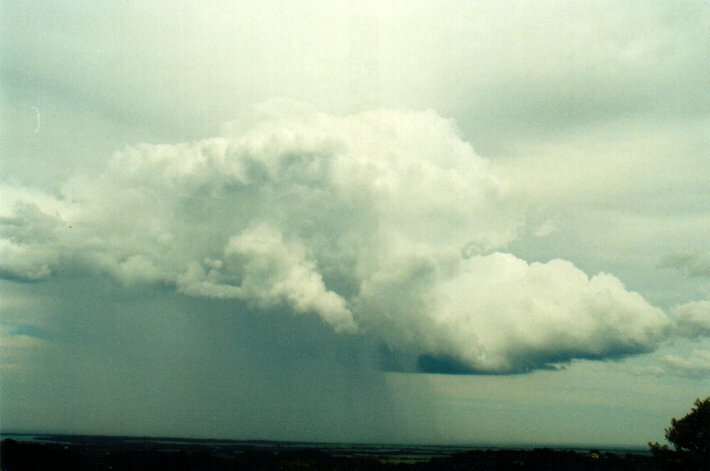 The cell was rather low topped, there was no lightning observed and it appeared that the cell would just dump a load of rain and die. So I decided to take the Bangalow Road out of Lismore which heads NE through more rural areas, rather than the Bruxner Highway which heads east but through all the Lismore suburbs. 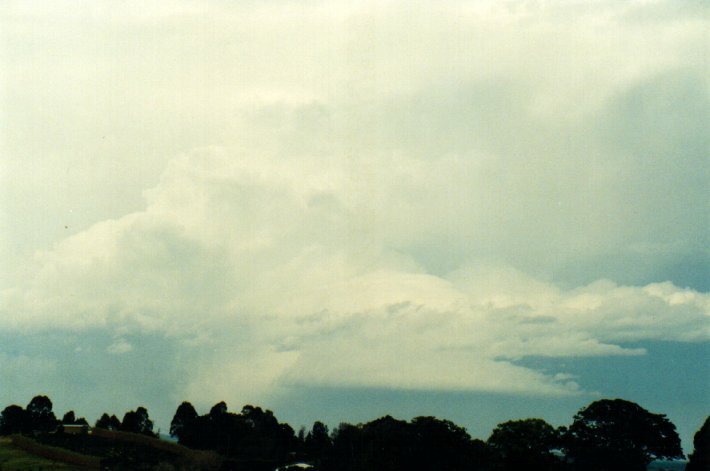 A few minutes after heading out of Lismore the cell took on a much more organised appearance, almost as though there was updraft/downdraft separation. 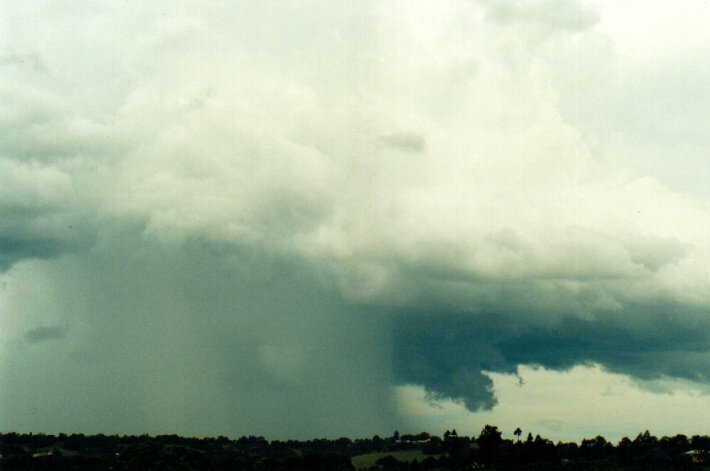 It very quickly developed a very significant lowering into the updraft on the right (southern) side while giving intense precipitation on the left. The photos illustrate the remarkable features for such a small cell. We followed it as best we could eventually getting back onto the Highway then east to Alstonville. 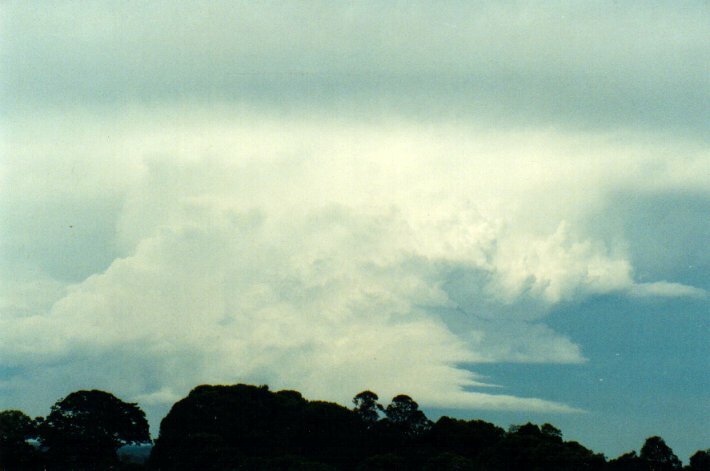 The storm had already passed over Ballina and was out to sea and weakening, but still exhibited nice features. 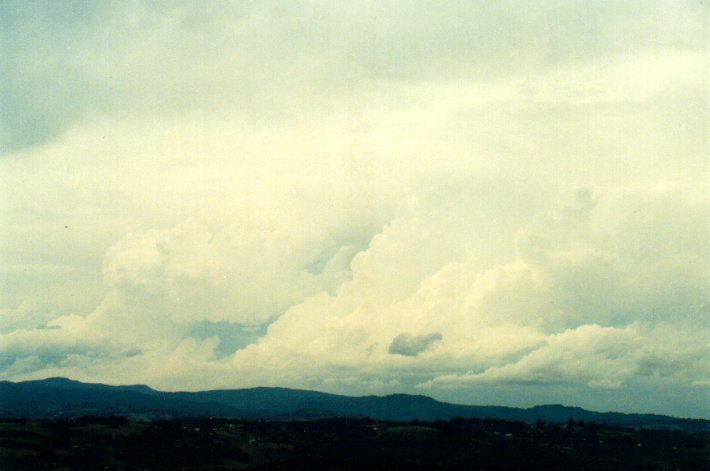 While at the lookout east of Alstonville a much larger multicell system came into view to the north. We decided to head back to my place at McLeans Ridges where the view would be expansive. The cell didn't disappoint. 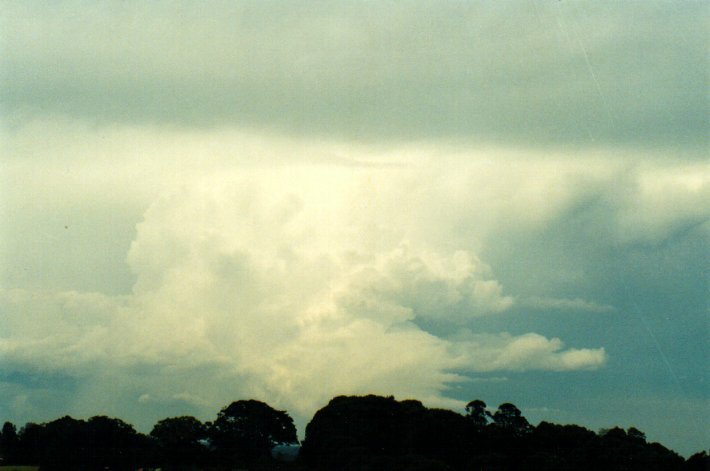 A lovely high contrast thunderstorm had developed and was tracking SE over the Tweed Coast about 50km to the NNE. 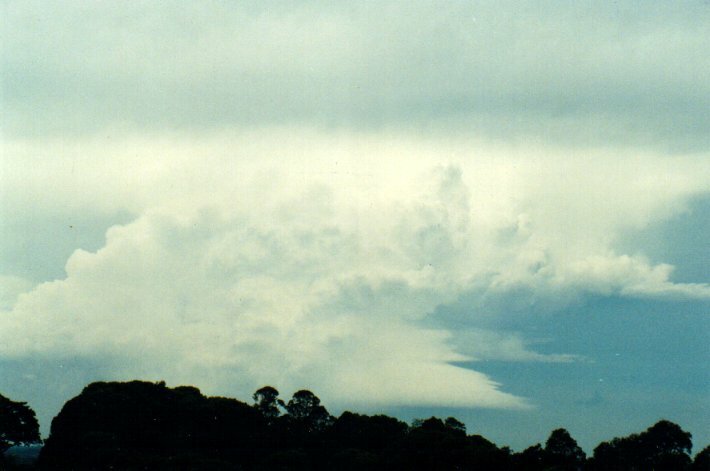 It had incredible structure with a boiling corkscrew-like updraft on the southwest flank, and soon a shelf-like feature on the south of the base. Between 4.10 and 4.20pm it transformed into something special. Several inflow bands developed on the southern side above the now apparent wall cloud, with a beautiful twisting meso very obvious in the updraft. 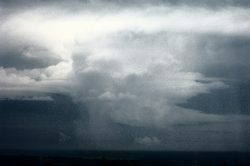 It was very exciting to watch this right moving supercell. Dave decided to head back east and try to see the storm base more clearly. What an awesome sight!! This supercell looked like it would have to have something attached to its base! 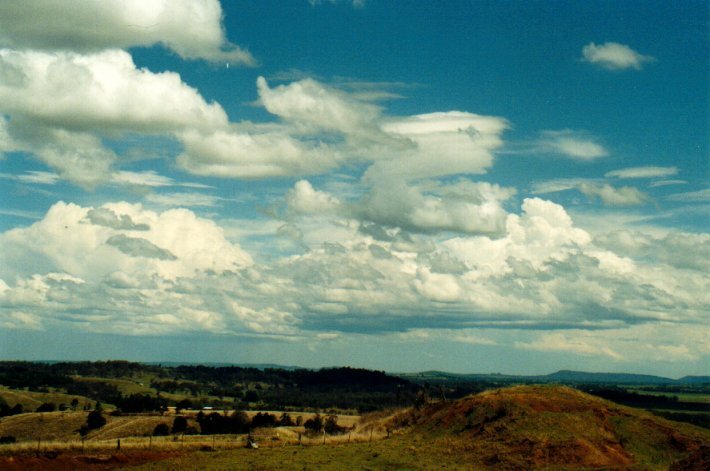 I said to Michael that I thought it would be best if I headed to a lookout where the base would be visible. So I went off to catch a tornado (not really thinking there would be one at the time). I raced home to grab my dad who had been keen to go on a chase for some time. He had been unaware of the storm and when I told him to look out the window he was pretty impressed! He grabbed the keys off me and said he was driving. So I grabbed the binoculars and we were on our way. It was about a 10min drive to the lookout from my place. 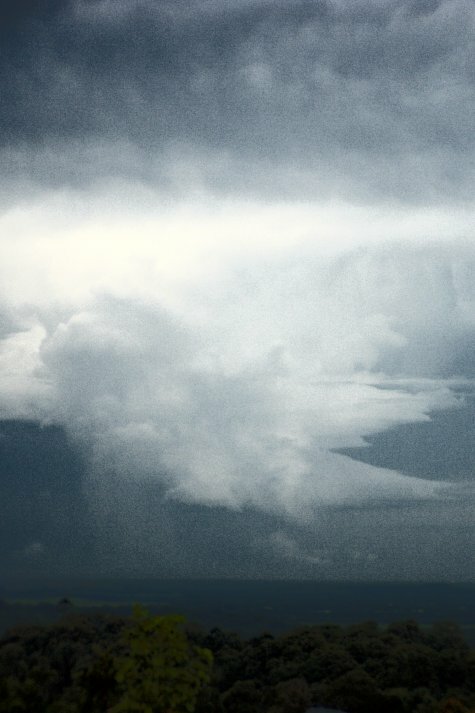 The storm was off the coast of Cape Byron and was heading in a SE direction. It turned out later it was the right mover of a split supercell. Once there I couldn't believe the structure of this thing. It looked like something out of a book! 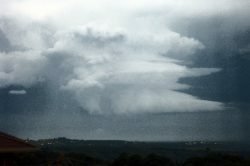 So I pulled out the Kodak DC4800 (who was on his first storm chase) and started madly taking photos! 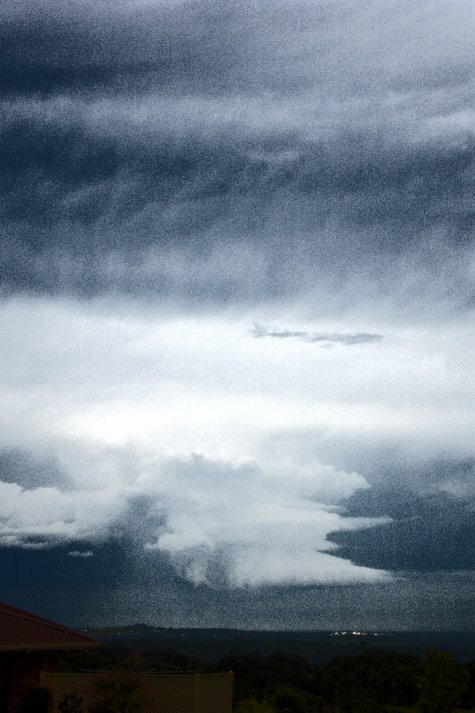 By this time the contrast of the storm against the rest of the sky was low. I handed dad the binoculars and told him to watch the base closely for anything. After a few more photos I thought I could see something - but just barely. I got the binoculars off dad and could see scud forming under the wall cloud. This was at 4.46pm. I watched it develop quickly into a very thin line barely visible through binoculars. I spent the next 20 secs trying to get a photo of this structure but couldn't as it was too far away. I jumped into the car to check the photos I'd just taken on the LCD (the screen was too dull to view in the outside light). Whilst doing this dad said he could see something. 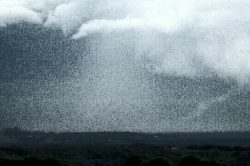 I quickly turned around to watch scuds quickly form into a funnel. It didn't descend so much from the base, it just appeared, appearing to touch the ocean very quickly. I tried taking photos with the camera's telephoto lens on, and with digital zoom (all up 12x zoom). This was at 4.48pm. I then rang Michael to let him know. He was watching the storm from his place but couldn't see the base or the funnel. Once letting him know, I took a picture at 4.49pm and another at 4.50pm and then it disappeared, as quickly as it formed. 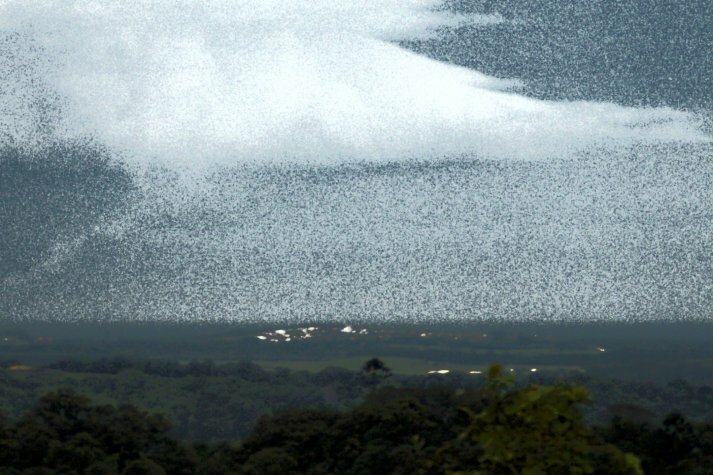 We watched scuds form near the ocean for about 10 minutes after the tornado collapsed. 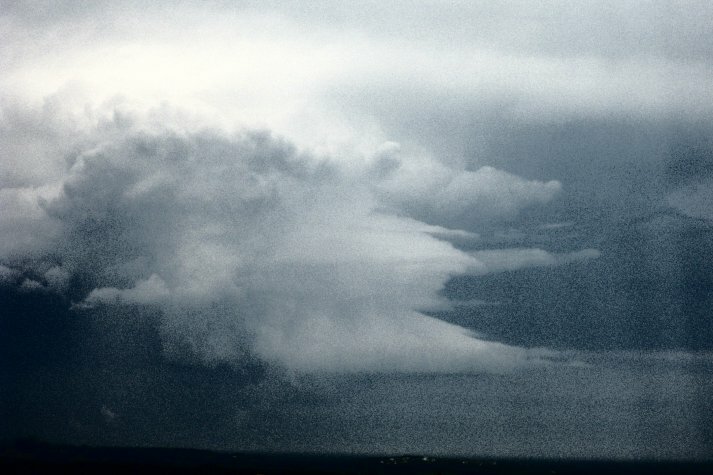 From then the supercell collapsed both visually and on radar. So we headed back, both VERY excited, to our home in Wollongbar. I ran inside and told mum I had seen a tornado and her reply was 'oh, that's good'. After explaining to her what this meant she seemed a little more enthusiastic. Oh well. Dad scored all right for his first chase. Finally, the start of the season here in NE NSW!! 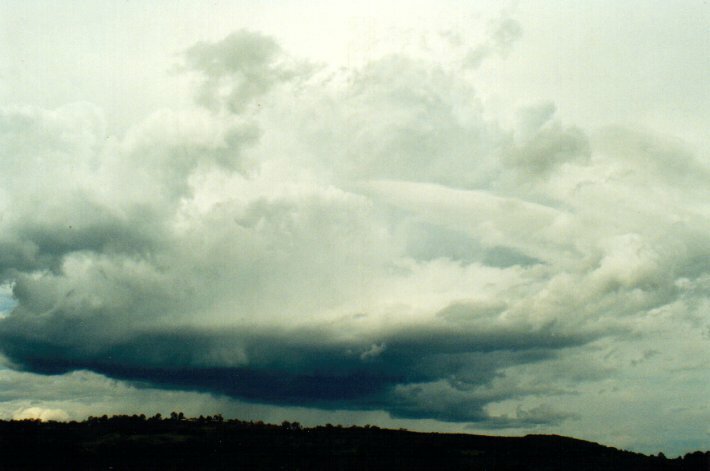 The following digital photos by Dave Ellem have been enhanced to illustrate the supercell features and the tornado - click for a larger view. 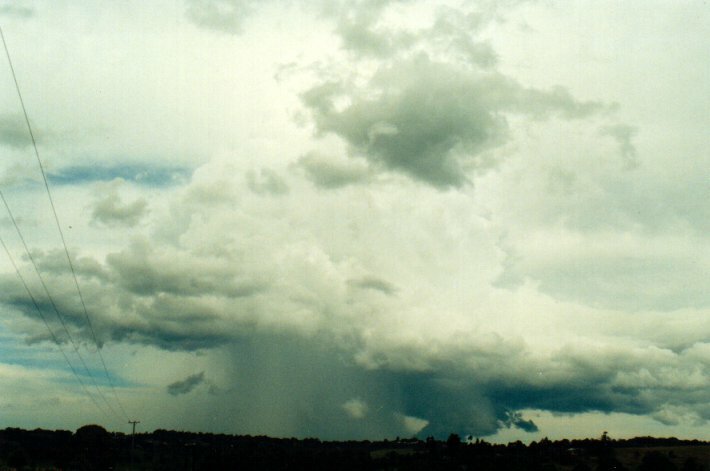 Radar shows this storm system formed about 20km south of Beaudesert in Queensland around 14:30. 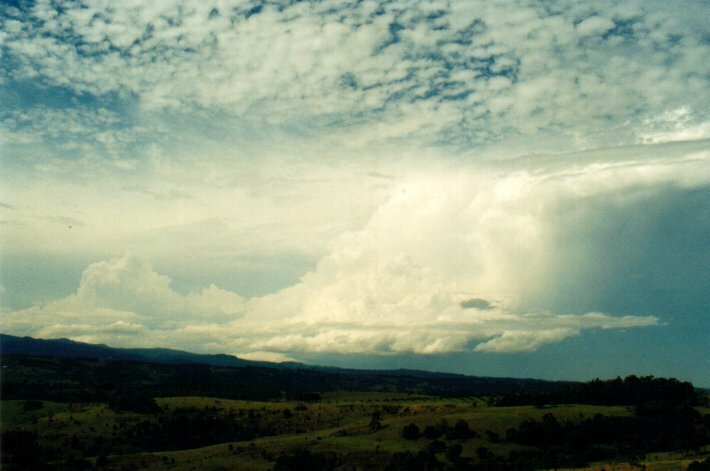 The cell was initially a multicell but made the transformation into a supercell between 15:50 and 16:00 as the complex crossed the Tweed Coast and split into two storms. 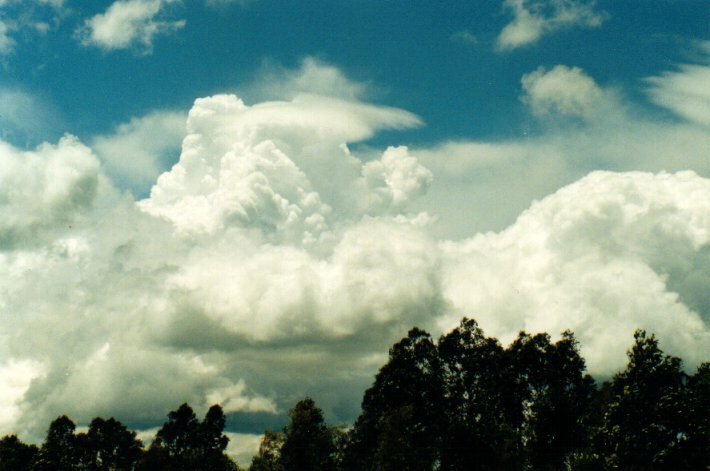 The right mover as described above was the stronger of the pair and had a slightly more southerly track than the left mover. 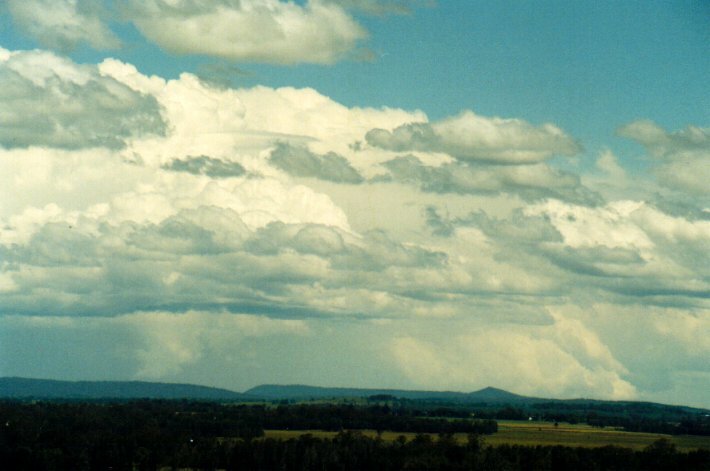 At all times the storm was at the outer limit of both Brisbane and Grafton radars, but even at 120km distant shows high reflectivities. 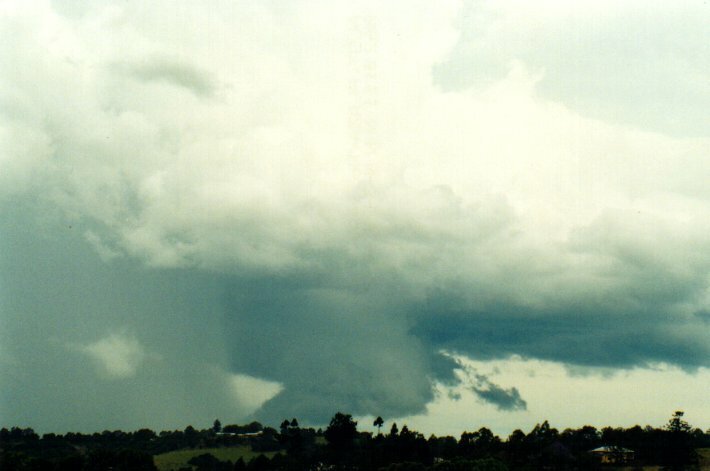 The supercell was influenced by a localised S-SE wind along the coast south from the storm, and this probably enhanced the mesocyclone enough to produce the tornado. It is also apparent the meso was rotating anti-cyclonically.